My mom used to make clay for us when we were little, in big huge batches. We’d all put on aprons and sidle up to the kitchen table on snowy afternoons where we played away for hours. The recipe couldn’t be easier, and making homemade clay with your kids is a really great activity. There’s lots of measuring and mixing and distracting from the fact that mommy probably feels a little bit bananas and needs something for the little people to do while she steals away and reads a good book. I’m projecting a little, aren’t I? I double the recipe because 1 batch of clay doesn’t give me enough to really work with. — UPDATED — I totally forgot to add the Cream of Tartar in my original version. Dingbat. Anyway, add it when you add the rest of the dry ingredients, it’s pretty critical. 1. In a large pot on the stove, heat up the water and the vegetable oil on medium to high heat. You don’t want to boil anything though. 2. Add the salt to the liquid. 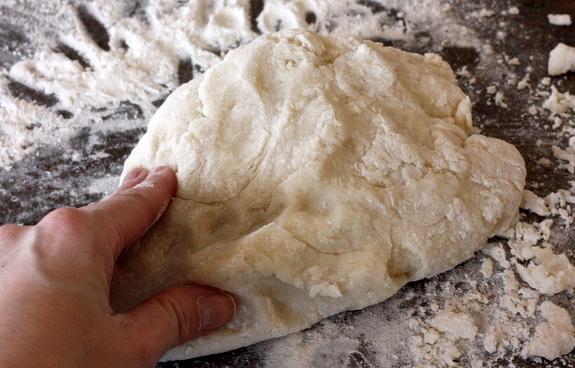 Be sure to really cook it until the salt completely dissolves or you’ll have super salty chunks in your dough. Nobody wants that. 3. A little bit at a time add the flour into the mixture. 5. 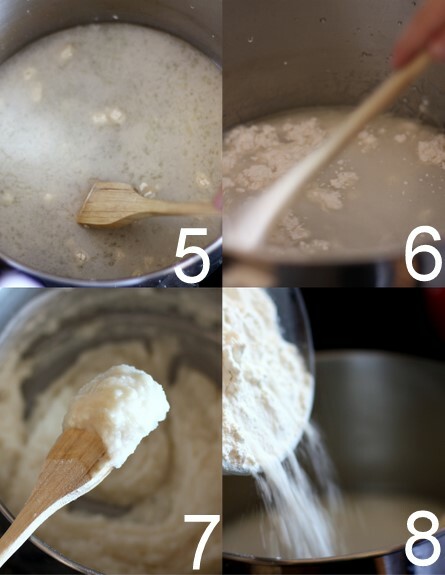 Mix the flour in with a wooden spoon until it dissolves. 7. Until you get a really pasty looking mix. 8. 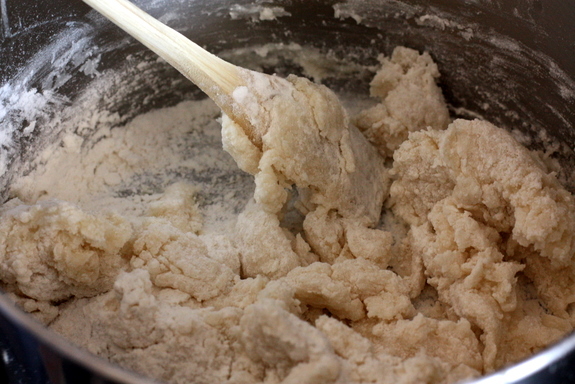 Now add more flour and keep stirring until you’ve used all the flour. 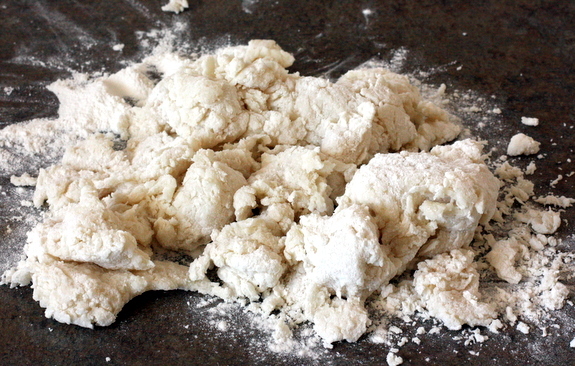 The dough is going to look a little bit clumpy and doughy. It’s okay, you want it to look clumpy. 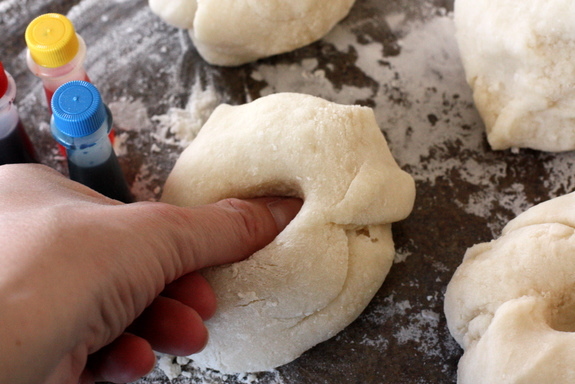 Flour your counter top or work space and dump the dough. That doesn’t sound too great, does it? Knead the dough like you’d knead a loaf of bread, until it isn’t sticky anymore, and separate it into a few balls of dough. However many different colors of clay you want. This is your rodeo. 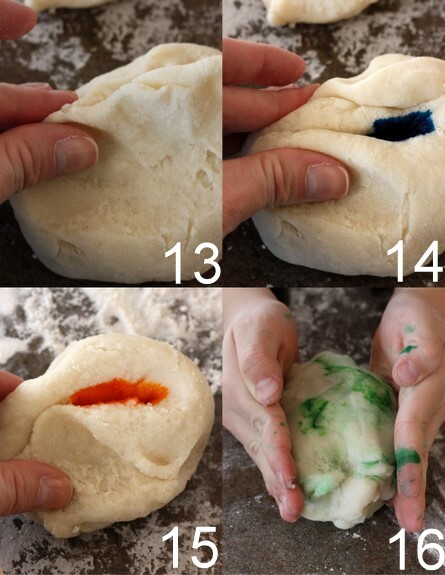 Make a well for the food coloring by sticking a finger into the dough. 9. Now drip a handful of drops of food coloring into the well. 10. I use about six drops. Get a little crazy with the color, I’ll allow it. 11. 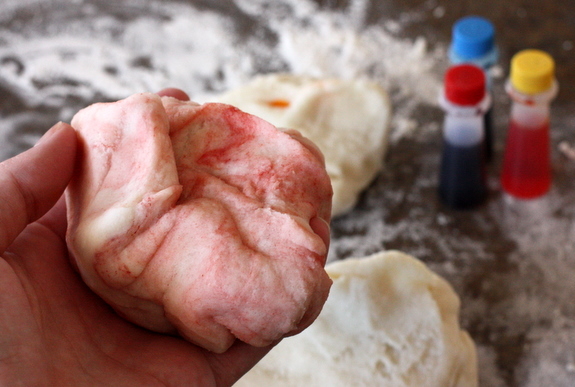 Let the color seep into the dough a little bit. 12. 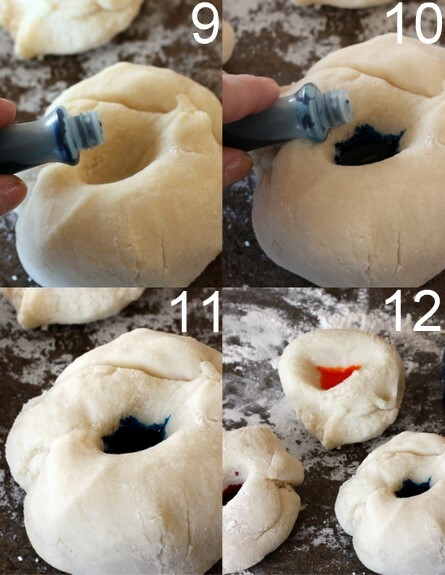 Now drop food coloring into each ball of dough, mixing colors as you see fit. I trust you. 13. Pinch the color together to make a little clam shell of clay. 14. Do this until you can’t see any color at all. 15. Now start mixing the color and the clay together. 16. Until you get a marbled effect of food coloring and clay. This is where the little kid helpers come into play. Now play to your heart’s content with your little clay creation. When you’re finished, don’t throw it away, store it in an airtight container for up to 6 weeks in the refrigerator. You clever, clever thing, you just made homemade clay. 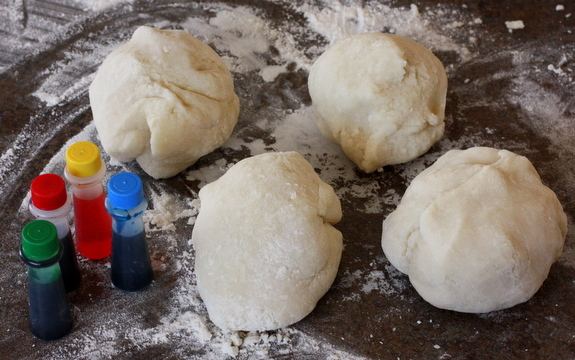 We made our own playdough too–the real thing is too expensive! Why waste that money–said my dad. Bonus, this playdough won’t have that real playdough smell, which, to tell you the truth, kind of makes me sick. 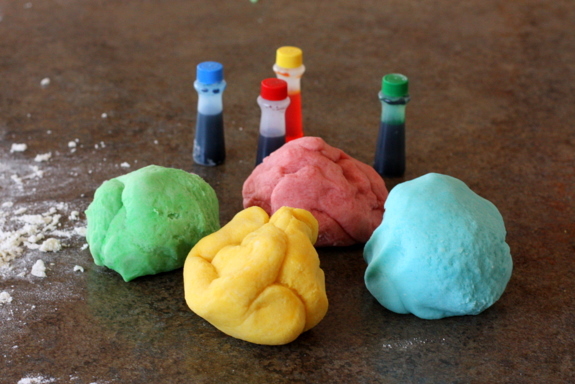 This is by far our favorite recipe for play-doh. And it lasts forever. Case in point: I cleaned out the pantry over the weekend and found a bag that was at least 9 months old and it was STILL good. Presto! Instant fun. Ha! That’s fantastic. Ours has been in the fridge for at least a month and isn’t showing any signs of wear. It doesn’t make you weird at all, when I make it I get a little teary eyed every single time. Smells like the safety of childhood. Love it! You probably did see at at my house, my mom made it all the time for all the rowdy neighborhood kids! maybe i just missed it but where does the cream of tartar come in? is it just combined with the flour? You didn’t miss it, I ended up pulling the photo. 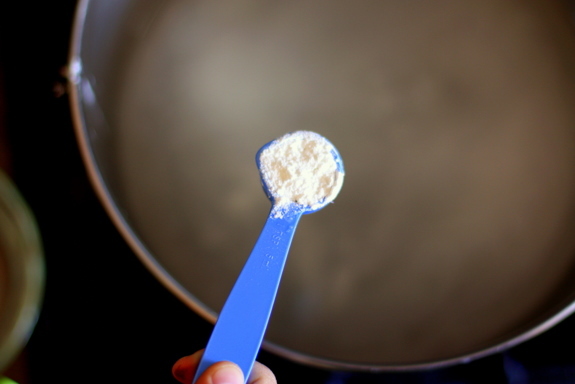 Add it when you’re adding the dry ingredients to the water on the stove. Have fun! My mom so made something like this when I was a kid. I don’t know if the recipe is the same, but it’s floating around the recipe cupboard somewhere. She would add Kool-Aid to it to give it a great smell and colour. It worked really well. It smelled so good you could eat it, and we did. Luckily, it’s totally edible. My mom was never a big fan of food colouring, so that’s where the Kool-Aid came about. We had all kinds of colours. It was the only time we ever had Kool-Aid in our house. We weren’t really allowed sugary drinks on a regular basis, and thank jeebus for that. But, I digress. My mom made this a few times when I was a kid, but I’ve never made it. I’ll have to bookmark it and come back to it soon! Do Rachel, it’s so much fun. 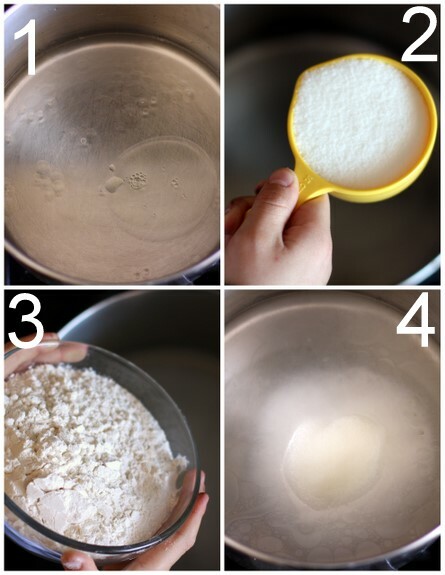 I am a preschool teacher and your recipe is good but you forget to let the readers know to add the cream of tartar which is very important for the perfect texture and longevity of the dough. Also, to make it even smoother, tablespoon of oil to the water is essential! It also a lot easier to mix and add all the wet ingredients (including the food coloring if your just doing one color) in the pan, mix all the dry ingredients in seperate bowl and add to liquid. Just some tips! 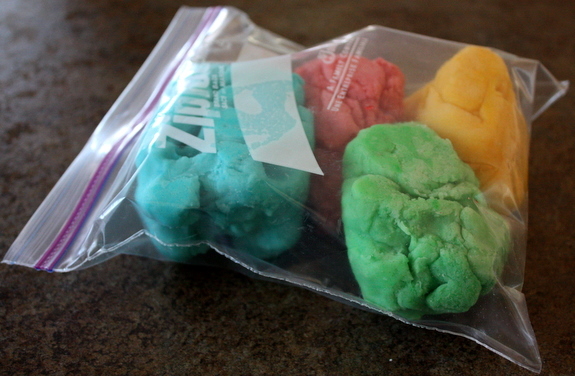 I am known fro making the best play dough so you may want to try and see how you like it! I totally omitted that step somehow in the editing of photos! You’re right it’s critical. I think my mom used to add oil too, but I’ve never used it when I’ve made clay. Such a good tip though. We made this today and it was a huge hit. Two things: When do we add the cream of tartar? I just tossed it in randomly. The salt never disolved either? Oh well. It was perfect for our lazy afternoon! Jaime, I totally deleted that photo on accident. 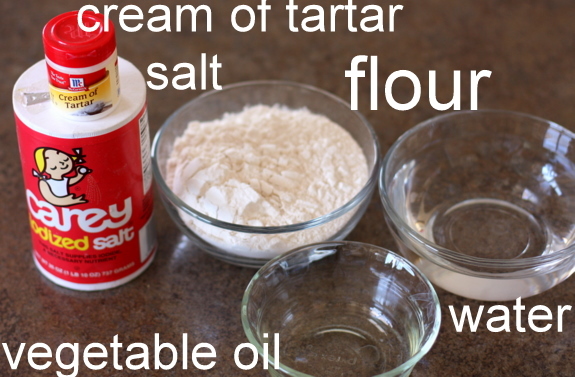 Add the cream of tartar when you’re adding the salt. You really need to heat the salt for a good while in the boiling water before it dissolves completely, and sometimes it never dissolves all the way for me. So glad you made it though, even with my sketchy directions! It’s been raining like crazy in LA and more is predicted for the weekend – this is perfect for keeping Bubba entertained. Thank you!